As with all our products, the medium and large sized LCD displays (including colour versions) are designed for accuracy and reliability. The LCD signature pads sizes - 4" x 3" (100 x 75mm); 4" x 5" (100 x 125mm); and larger colour models provide broad substantial LCD screens to display information and capture signatures whilst maintaining a small footprint and portable style. Connection options include HID USB; Serial, Virtual Serial,Bluetooth and WiFi. The 4" x 3" (100 x 75mm) models are available with a touch-sensitive SigLite sensor and stylus in place of the electromagnetic SignatureGem pen and digitizing surface. 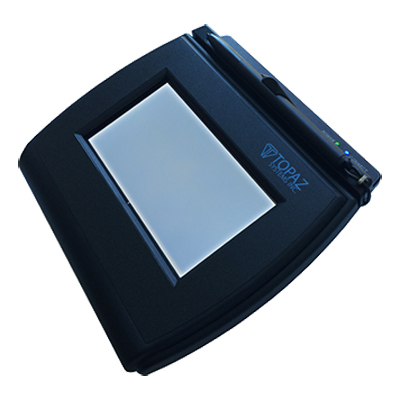 All models support interactive applications, allowing data to be displayed on the LCD as well as capturing signatures. 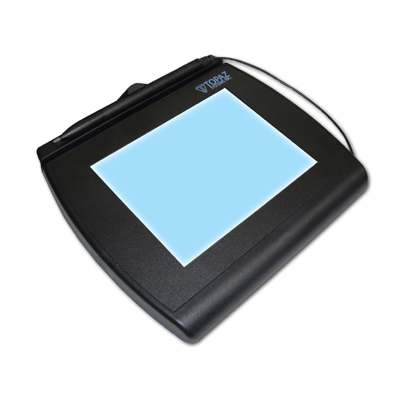 The SigGem® Color 5.7 models are our largest, rugged, and advanced biometric electronic signature pads with 5.7 inch, full-color TFT VGA (640 x 480) LCD. With the tempered glass LCD display, these models show the signature on the signature pad, as well as the computer screen. Bundled secure software APIs provide for interactive text, graphics, and pen-tap hotspots and checkboxes, which enable users to navigate screens, read agreements, and select preferred options before signing. The SignatureGem® LCD 4x3 includes all the high-quality electronic signature capture features of our signature pads with the added feature of an LCD interactive display, allowing users to see "electronic ink" under the pen tip as they sign as well as navigate and display text and graphics. This unit has a WiFi Sled included which allows connectivity across a WiFi network. The SignatureGem® 4x3 Backlit LCD BT has the additional feature of wireless capability through Bluetooth. Featuring a large backlit LCD screen and stylus, this model shows the signature on the pad and the computer screen. The SignatureGem® LCD 4x5 includes all the high-quality electronic signature capture features of our signature pads with the added feature of a backlit LCD interactive display, allowing users to see "electronic ink" under the pen tip as they sign as well as navigate and display text and graphics. 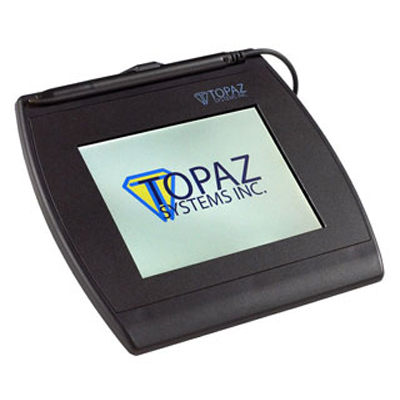 The SignatureGem® LCD 4x5 includes all the high-quality electronic signature capture features of our signature pads with the added feature of an LCD interactive display, allowing users to see "electronic ink" under the pen tip as they sign as well as navigate and display text and graphics. 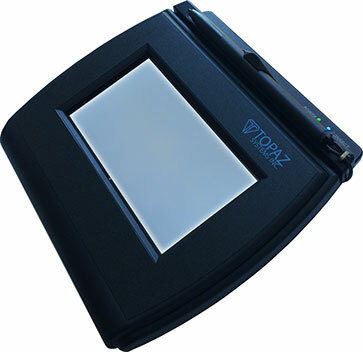 The SignatureGem® Backlit LCD 4x5 models integrate all the high-quality biometric and forensic capture techniques of a SignatureGem® devices, with the added feature of a bright backlit LCD interactive display. The SignatureGem® LCD 4x5 models allows users to see "electronic ink" under the pen tip as they sign as well as navigate and display text and graphics. LCD pads will show the signature on the signature pad, as well as the computer screen. The large signing area and rugged tempered glass signing surface make this a versatile pad for the most demanding applications. This virtual-serial device has been specifically designed for use in remote usage environments such as Citrix or Terminal Services, and has an integrated Serial-to-USB converter. SignatureGem® LCD 4x3 includes all the high-quality electronic signature capture features of our signature pads with the added feature of an LCD interactive display, allowing users to see "electronic ink" under the pen tip as they sign as well as navigate and display text and graphics. The SignatureGem® Backlit LCD 4x3 models integrate all the high-quality biometric and forensic capture techniques of a SignatureGem® devices, with the added feature of a bright backlit LCD interactive display. The SignatureGem® LCD 4x3 models allows users to see "electronic ink" under the pen tip as they sign as well as navigate and display text and graphics. 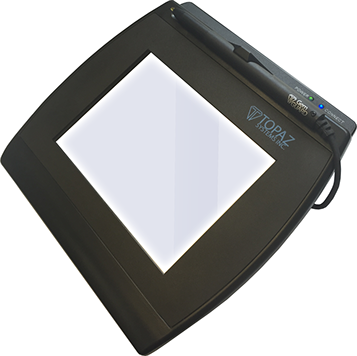 SigLite® LCD 4x3 includes all the high-quality electronic signature capture features of our signature pads with the added feature of an LCD interactive display, allowing users to see "electronic ink" under the pen tip as they sign as well as navigate and display text and graphics. The large signing area and the touch-sensitive surface provide excellent price-performance characteristics and long life. The SigLite® LCD BT 4x3 has all the benefits of our electronic signatures plus the additional feature of wireless capability through Bluetooth. 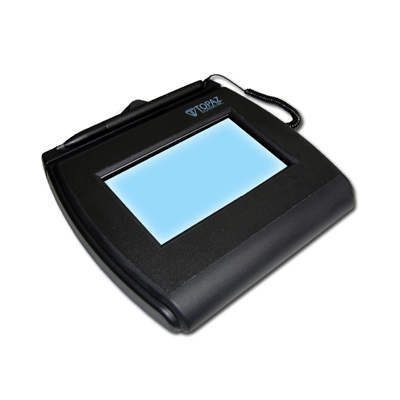 Like the T-LBK750SE, the T-LBK750SE-BT is our lower-cost, pressure-sensitive electronic signature pad.